Betting on Dice Games: How, where and why (or why not). When we think of gambling, most of us picture slot machines, card tables, or horse tracks. These are the most traditional ways to place a wager. But they’re far from the only ways. Some people especially enjoy taking a risk on dice games. Craps isn’t the only casino game to employ dice, either. Sure, it’s the most common, and by far the most popular. But standard craps isn’t for everyone. That’s why I’ve decided to create this brief profile of five fun ways to bet with dice. 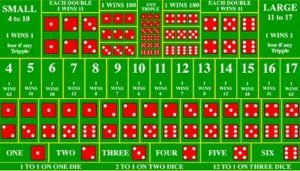 The following descriptions of casino dice games are meant to help readers decide which games they might enjoy most, how to play them, and where they can be found. Enjoy! Obviously, craps has to top the list. It’s been available for decades, from every multi-billion-dollar gambling establishment in Vegas, to back street alleys in every major city around the globe. How: Generally, craps requires just a few accouterments to play. You’ll need a pair of dice, a shooter, a croupier (to take bets), and at least one other person to bet with or against the shooter; the more players the better. The number rolled determines whether bets are won or lost. Learn more about How to Play Craps. Where: Virtually any casino that offers tables game will have a craps table running 24/7. Listen for the raucous cheering of a crowd and head in that direction. You’ll also find it at every online casino known to man. Why / Why Not: Craps is considered one of the most exciting games ever played at a casino. Don’t let the crowds or complexity of the betting diagram fool you. There’s nothing more exhilarating on the live casino floor! Is craps proving too hard to wrap your brain around? Check out the simplified, single-die version of the game known as Die Rich. How: Die Rich is played just like traditional craps, but with a single die instead of two. Players can bet with the shooter on the Pass Line, but not against (no Don’t Pass bets). If a 6, the bettor wins. If a 1, the bettor loses. Any other number (2, 3, 4, 5) becomes the point. The shooter has 3 chances to roll the point again, or all bets are lost! This G2E demo video explains How to Play Die Rich Craps. Where: Die Rich isn’t available at too many casinos, but you can find it in several Las Vegas locations, including The Luxor. Why / Why Not: This is a very quick and super-simplified way to shoot dice, and for that reason a lot of people do enjoy it. However, the odds are about 2x worse than traditional craps. How: As the name implies, crapless craps doesn’t offer any number rolls that cause a player to crap out on a new shooter. Normally, rolling a 2, 3 or 12 on the come out roll is an instant loss, and an 11 an instant win (for pass line bettors). In this version, all numbers except 7 will establish a point. 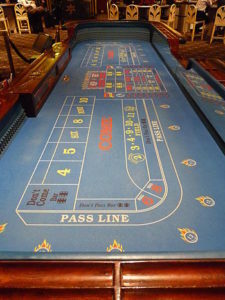 Where: There are a few casinos around the globe, mostly from Vegas to Atlantic City USA, that offer this unique craps variant. I have yet to find it at any online casinos, though. Why / Why Not: It would seem that having 6 ways to win on the come out and no ways to lose is a good thing. In reality, because the rarest rolls (2, 3 11 and 12) can become points, the shooter is less likely to make their point before rolling a 7. As a result, the pass line house edge rises from 1.41% to 5.38%. Ouch! I’d recommend passing on this one. Sic Bo is a famous Chinese gambling game. The name Sic Bo literally means “precious pair”. It’s extremely popular in Asia culture, and spread to North America in the late 1900s. How: Sic Bo involves the rolling of three dice. Players can bet on a variety of outcomes, depicted on the table’s diagram. Common wagers include Big (11-17), Small (4-10), Odd or Even (except triplets), Combinations, Singles, Doubles, Triples, Totals, etc. New Jersey DGE details how to play Sic Bo in Rules of the Game: Sub-Chapter 9 (page 280). Where: Once restricted to Asian casinos, especially in Macau, China, Sic Bo is now available in every major casino around the globe, and every online casino worth visiting. Why / Why Not: Sic Bo is essentially a three-dice version of craps, where many more combinations can be rolled and wagered on. The game is quite exciting to play! It’s got some unsavory odds though, ranging anywhere from 2.78% (Big, Small, Odd, Even) up to18.98% (9/12). This last section of fun ways to bet with dice covers not a single game, but all traditional ‘family dice games‘. I’m talking about the games most of us grew up with as kids – Farkle,Yahtzee!, Backgammon, Monopoly, Qwixx, Bunko, etc. How: Pick up one of these great games at your local toy store and read the instructions. You can bet on them in many ways. Play for penny-a-point, build a pot, take straight-up bets; it all depends on the game you choose and what the players agree on. Where: Anywhere you like! 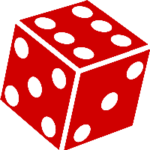 All dice games can be played at home, and most on computer, or any mobile device with an internet connection. As the saying goes – there’s an app for that! Why / Why Not: Betting on dice games is fun; plain and simple. When it comes to high-strategy games like backgammon, it can be a nice way for the best players to make a little extra cash.